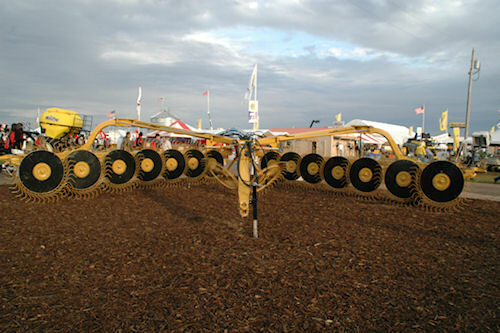 Vermeer's new gutsy high-capacity wheel rake covers 28-feet at a time. High labor costs and finicky weather make "hay making" a do-it-now-or-maybe-not-at-all proposition in many areas of the nation, so Vermeer is adding a new high capacity wheel rake to the mix to make timely hay pickup easier. The VR1428 made its debut at Husker Harvest Days this year, and features a 28-foot working width with a newly-designed, beefed-up frame and running gear. The VR1428 features a non-bolted, non-telescoping tongue and a bent-tube frame, rear frame and fold arms. The tougher machine rides on a patent-pending rake wheel lift and suspension system. Vermeer's new VR1428 high-capacity wheel rake offers more speed and capacity to hay producers with a 28-foot swath and a beefed up frame and running gear. Tool-free adjustments and a unique center splitter attachment make covering wide swaths a breeze, even in tight time schedules ahead of rain or storms. And, because the VR1428 is designed to follow closely behind the tractor, maneuverability is improved over many competing models.